The Aruba Sensor (AS-100) is Beacon hardware that will use your Wi-Fi network to remotely manage your battery-powered location and proximity Beacons, in addition to functioning as a location or proximity Beacon. The Aruba Sensor has been discontinued. Aruba will continue to support Sensors currently in use. Without any special customization, the Aruba Sensor can be deployed like any other proximity or location Beacon. To enable the Aruba Sensor's Beacon management features, you'll need to enable them in the Meridian Editor. This article describes how to do that. 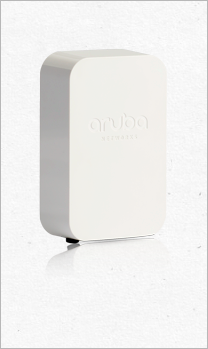 The Aruba Sensor supports Beacons Management on any vendor's Wi-Fi network. The Aruba Sensor won't connect to network SSIDs with unicode characters or spaces. The connection is over HTTPS on port 443. If you're using a firewall, you'll need to make sure that port is open. In order for your Sensor to communicate with the Meridian server, you'll need to give it access to your Wi-Fi network. To enable Beacons Management, in the Meridian Editor sidebar, click Beacons. To the left of the List and Map buttons, click the Settings gear button. Click Enable Beacons Management. This generates the Access Token you'll need to configure your controller so that your access points will recognize your Beacons and communicate with the Meridian Editor. In order for the Aruba Sensor to enable remote Beacon management, you'll need to enter your Wi-Fi network information on the Meridian Editor Beacon Management Settings page. On the Beacons > Settings page, click Aruba Sensor Wi-Fi Settings. There are three different Wi-Fi network types: Open, WPA2-PSK, and WPA2 Enterprise. If you're not sure what Wi-Fi network type to use or the Wi-Fi authentication details, contact your local network administrator. If your Wi-Fi network doesn't require authentication, use the Open network type. In the SSID field, enter your Wi-Fi network name. If your Wi-Fi network uses WPA2-PSK authentication, click the NETWORK TYPE dropdown, and then click WPA2-PSK. In the PASSWORD field, enter the Wi-Fi password. If your Wi-Fi network uses WPA2 Enterprise authentication, click the NETWORK TYPE dropdown, and then click WPA2 Enterprise. In the SSID field, type your Wi-Fi network name. In the USERNAME field, enter the Wi-Fi username you've created for the Sensor. Please note that the Aruba Sensor does not currently support WPA2 Enterprise certificate-based authentication. Make sure you've entered your Wi-Fi information on the Meridian Editor's Beacons > Settings Wifi Settings page. Like any other Beacon, you'll use the Aruba Beacons app to deploy the Aruba Sensor. Open the Beacons app and go to the map where you'll be deploying the Aruba Sensor. Tap the Nearby Beacons button to bring up the Beacons list. The Nearby Beacons list is sorted by distance, with the closest Beacons listed first. Find the Aruba Sensor BLE Mac address in the list. Tap and drag the Aruba Sensor to its location on the map. Choose the Beacon type. If it's a proximity Beacon, tap and drag the slider to set the power level. If you want to give the Beacon a name, tap the Name field, and then enter a name, such as "Sensor". If the Beacon Management Wi-Fi settings are correct, the Beacons app will download the network settings and configure the Aruba Sensor. There may be times when you want to move your Aruba Sensor to a different location. If you do so, you'll need to reset the Aruba Sensor when you put it in its new location. Before you move the Aruba Sensor to a new location, use the Aruba Beacons app to delete the Sensor from the map. Find the Aruba Sensor on the map. Tap the Sensor icon and then tap the delete button. Confirm the delete. Unplug the Aruba Sensor. Before plugging it back in, press and hold the reset button for at least five seconds. While pressing and holding it, turn on the Aruba Sensor. Use the Aruba Beacons app to deploy the Sensor to its new location. When the Aruba Sensor is on, but not connected to a Wi-Fi network, it will blink orange. When the Aruba Sensor is on and connected to a Wi-Fi network, it will blink green.